Imagine this. It is a beautiful day in the White Mountains and you have decided to take a hike with a couple of your friends to enjoy the weather and to take in the beauty of Mount Washington. However, when you are about to reach the top you find yourself looking at a hotel standing around 1,000 feet below the summit with tourists swarming around it. This may become a reality due to the recent plans by Wayne Presby, the owner of the Cog Railway, who wants to build a hotel about 1,000 feet below the summit of Mount Washington. The hotel would have 35 rooms making it relatively small, but this prospect still has many hikers concerned. My first question when I heard of this was: is that even legal? It is indeed legal. The person who would create the hotel, Wayne Presby, owns the railway that goes up to the summit of Mount Washington; he owns a strip of land on either side of that railway, so, therefore, he could build on that land. His argument as to why this should be allowed has two main components. The first is that a primary business in New Hampshire is tourism, and this hotel is would promote just that, so he doesn’t understand why building a hotel on Mount Washington would be any different than building one in a town. His other argument is that it could save lives. Due to the constantly changing and unpredictable weather in the White Mountains, hikers often get trapped on top of Mount Washington and die from exposure. Presby says that if the hotel was present they would be able to stay there and be safe. While some of his argument is compelling there are still many people against it. In early December a petition was set up by a group of angry hikers against the potential hotel, and so far 18,778 people have signed it. There are many arguments coming from this group of people as to why it should not be allowed. The first is that there is already enough tourism on top of the mountain. According to an article in the Boston Globe over 370,000 people visited the top of Mount Washington, of which 270,000 either drove or took the cog railway up. The line to take a picture with the sign on the summit can sometimes be over a football field long. The next argument is that there are 5 endangered species that make their homes around the summit of Mount Washington and having a hotel built there could lower their numbers even more critically. It may also pollute the area; the railway already has a lot of debris and litter along the tracks and many hikers fear that having a hotel along there would make it even worse. The last argument is that it would be damaging to the beautiful natural landscape. On this topic, I have to side with the hikers and naturalists who are firmly against the hotel. I have hiked all over the White Mountains, and I have to say that it was one of the most disappointing things when I reached the top after a long sweaty hike and had to wait in line with a bunch of tourists who had simply driven up in their cars to get my picture taken. There are already two buildings on top of the mountain and many parking lots. It is very frustrating to get to the top and find people walking around the summit in heels. I think that the hotel would be damaging to the environment, and while it may be a safe haven to hikers in bad weather, the good, in this case, does not outweigh the bad. The question is, however, will this really happen? It is legally allowed. However, due to intense opposition, the matter is still up in the air. 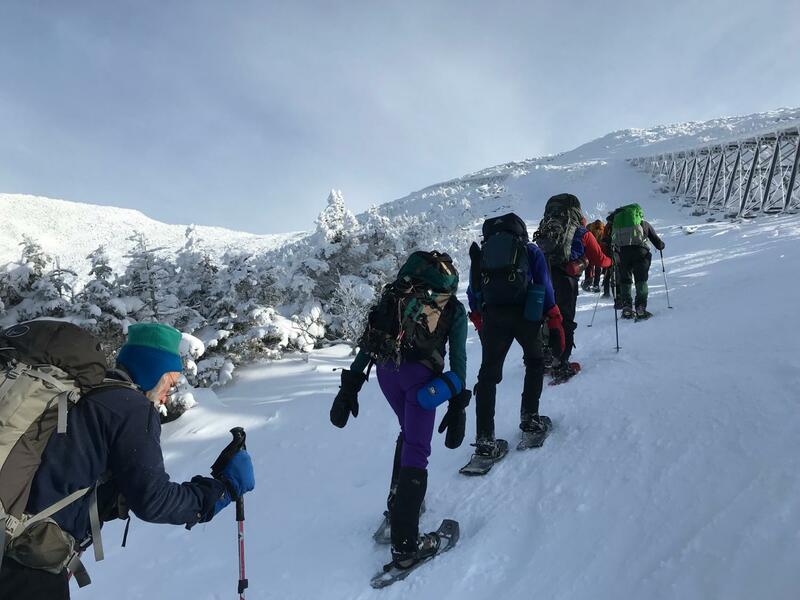 The Appalachian Mountain Club (AMC) in recent years said that they wanted to make a new hut on Mount Washington because the one currently there is always fully booked, but, due to backlash from hikers, they chose not to. The matter of the hotel is still up in the air, but the decision on whether or not the plan will continue will be announced in the coming year. Nice job, Lilly Magnus. Accurate and succinct, and the picture is great. You must have gotten that from Liesl.